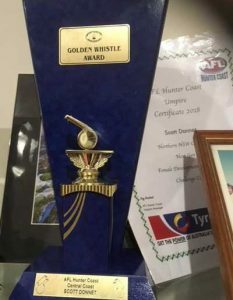 Congratulations to Scott Donnet in Year 8, who recently won the Central Coast/Hunter Junior AFL Umpire of the Year Award, the Golden Whistle. Scott was presented with the award at Wyong Leagues Club last week. A great achievement Scott.